The decline of the Gupta empire resulted in the emergence of numerous ruling dynasties in different parts of northern India. The prominent among them were the later Guptas of Magadha, Pushyabhutis of Thanesar, Maukharies of Kanauj and the Maitrakas of Valabhi. The political scene in the Peninsular India was no different. The Chalukyas and the Pallavas emerged as strong regional powers in Deccan and northern Tamil Nadu respectively. The Gupta Empire finally disintegrated around 550 A.D. about a hundred years and after their downfall a new kingdom arose in the seventh century at Sthaneswara, now Thanesar (near Kurukshetra in Haryana). That new kingdom was that of the Pushyabhutis. The dynasty became influential with the accession of Prabhakarvardhana, who was able to defeat the Hunas and strengthen his position in the regions of Punjab and Haryana. After his death, his elder son Rajyavardhana came to the throne but he was treacherously killed by Shashanka, the king of Bengal and Bihar. Then came its most famous ruler named Harshavardhana. He ascended the throne in 606 A.D. Sources of Harsha and his times comes from many sources i.e. Harshacharita of Banabhatta (the court poet of Harsha), accounts left by the Chinese traveler Hieun-Tsang and through the inscriptions and coins. He described as the lord of the north i.e. sakalauttarapathanatha. 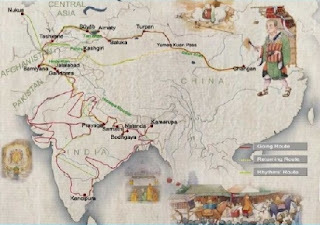 He set out on a long campaign and conquered many parts of Northern India, including the Punjab, eastern Rajasthan and the Ganga valley as far as Assam. Harsha’s empire extended over Punjab, Rajasthan, Uttar Pradesh, Bihar and Odisha. But when he wished to campaign against the kings of the Deccan, he was stopped by the army of Pulakeshin II, the Chalukya king of Vatapi or Badami in northern Karnataka. Harsha moved his capital from Thaneswar to Kanauj as Kanauj was a more central place. Some kings ruled their kingdoms independently but accepted the sovereignty of Harsha. They had to pay regular tribute, offer homage to the king and render military service in times of war. Harsha governed his empire on the same lines, as did the Guptas. But during his period the administration became more decentralized and the number of feudatories grew further. In Harsha’s time the officers and the religious persons were paid mainly in land. It encouraged the system of feudalism which grew much more in the post-Harsha period. The empire was divided into provinces called Desha. These were further divided into districts known as Pradesha. Officials those in charge of a district called Ayukta and those in charge of provinces were known as Kumaramatyas. In the empire of Harsha law and order does not appear to be so well maintained. Hsuan Tsang was twice robbed of all his belongings during his travels in India. On the other hand Fa Hien had to face no such difficulty during Gupta period. The status of women was subordinated to men because of complete dependence on men for their livelihood. The women were not entitled to inherit property. However, she had full right on her stridhana i.e. the presents received by the bride at the time of her marriage. The free representation of females in art suggest that there was no purdah system in the society. However, there is evidence of the presence of sati system. In the Harshacarita of Bana, the queen performs sati on the death of her husband king Prabhakaravardhana. Even Rajyashri, sister of Harsha was about to perform sati when Harsha rescued her. The nature of the economy during Harsha period became increasingly more feudal and self-sufficient. There was a decline of trade and commerce under Harsha, which is shown from the decline of trade centres, paucity of coins and almost complete disappearance of guilds of traders and merchants. The decline of trade and commerce affected the handicrafts and other industries because of no demand. This decline also affected agriculture though indirectly. Now the farmers began to produce that much only which was required to meet his own needs and those of the locality but not for the market, both internal and external. This naturally led to the rise of a self-sufficient village economy in which all the needs of the village were met from within and also marked by an increasing dependence on agriculture in that village. In the religious field, the ascendancy of Brahmanism brought about the decline of Buddhism. So, Vaishnavism and Saivism continued to be the most popular sects of Hinduism. Jainism were also practiced. The Vaishnavites were more prevalent in northern India and the Saivites in southern India. In Buddhism another new branch developed which is known as Vajrayana and a female deity known as Tara. Harsha was a devotee of Siva. He supported other sects and religions also. Every fourth year Harsha donated to the poor, ascetics, and all needy people at the time of Magha Mela at Prayaga. Harsha was interested in Buddhism and perhaps became a Buddhist in his later years. Harshavardhana was an accomplished veena player and literary personality. He wrote three sanskrit dramas also. In the seventh century Banabhatta, the court poet of Harsha, wrote Harshacarita praising his patron. Written in an ornate style, it became a model for later writers. The early history of Harsha is reconstructed on the basis of this text only. Another text written by him is Kadambari. Harsha too was considered to be a literary monarch. He is said to have authored three plays: Priyadarshika, Nagananda and Ratnavali. There was existence of the caste system and bad treatment of untouchables who had to live outside the towns. In the towns there was a difference between the houses of the rich and the poor. Not everybody was a vegetarian although people were encouraged to give up eating meat. The dress of the people varied from region to region. He describes Indian as hot-tempered and quick to anger, but honest. Indians were particular about cleanliness. There were not many criminals. There was no death sentence. Imprisonment for life was the most severe punishment. With the death of Harsha in AD 647, north India was again plunged into disorder for sometimes. His death was followed by a political confusion that continued up to the eighth century when the Gurjara Pratiharas, the Rajput rulers, emerged as a big force in northern India. Meanwhile in the Deccan and south India the kingdoms of the Chalukyas and that of the Pallavas became powerful.